Patios need professional cleaning to be maintained in good condition and don’t get slippery. By hiring our experienced staff to pressure wash your darkened and filthy pavements, tiles, slabs and brickwork you will have perfectly washed and presentable outdoor areas. We work in accordance with the customer’s demands and can provide spraying and sealing of the cleaned patios for protection, resistance and long-lasting effect. 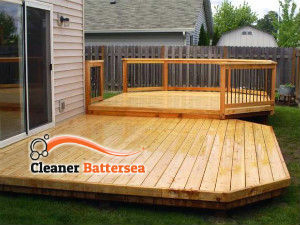 Our patio cleaning services are available in and around Battersea at reasonable prices. Use our patio cleaning services to have your pathways, pavements, external walls and fences located in SW11 perfectly washed and restored to their former glory. Our cleaning technicians have experience in jet washing heavily soiled, stained and messy patios and know how to achieve the expected results. You can count on them to clean the outdoor hard surfaces of your property after renovation and construction work. Our jet washing machines are powerful, advanced and ensure complete removal of stubborn dirt and grime. 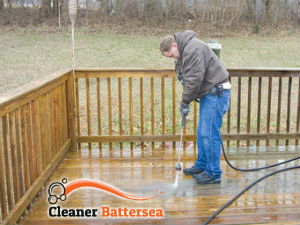 Contact our company whenever you need one-off or recurring patio cleaning in Battersea, SW11 or in the nearby areas. Over time garden pathways, bricks and pavement get overgrown with weeds, moss and lichen. Our staff can eradicate them as well as remove algae from all surfaces that make them slippery and hazardous. Using powerful and modern jet washing machines, they can restore the cleanliness of all kinds of patios, garden furniture and pathways. We guarantee the high quality of our services which can include covering the washed surfaces with sprays and sealants. We have a number of coatings for the customer to choose from. Our cleaning technicians can apply non-slippery, anti-weed, protective and resistant sealants.